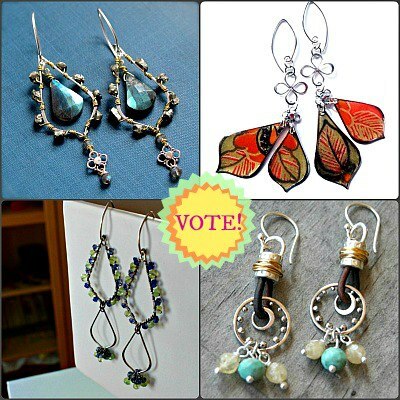 The voting for the Nina Designs Earring Design Challenge has started! CLICK HERE to go the Facebook page to place your vote. They all did a wonderful job and created really beautiful pieces! For my design, I prowled through the secret stash and found the beautiful, faceted, labradorite teardrop briolettes. I thought that their shape matched the sterling silver large pointed teardrop links almost as if they were made for them. The teardrop links frame the labradorites perfectly! I didn't want to leave the links plain though and embellished them by wiring on nuggets of pyrite. I used a gold-toned wire as a pop of contrast and to give the earrings a little bit of warmth. The pyrite marries the brassy gold color of the wire and the cool silver of the teardrop loop. I wanted to soften the look a little and add an extra dangly component to give them some playful movement, so I created a wire-wrapped link (strung up with a tiny faceted labradorite) and attached the floral sterling silver jewelry link. From that link, I created a wire-wrapped dangle with more faceted labradorites. These components were all hung from sterling silver contemporary marquis-shaped earwires. I think that my earrings turned out really nice! They're modern, but with a few Baroque flourishes. They've got amazing movement and the labradorites create lovely points of light. Even though I can appreciate the competition, I hope you vote for me! I really want to win. I love working with Nina Design components and a $100 store credit would score me a lot of beautiful treasures to work with! So vote for me! CLICK HERE to cast your vote... which I hope is for me! 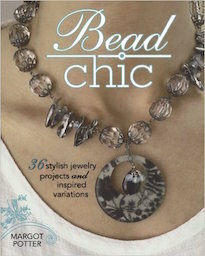 I'm happy to announce that I'll be participating in a fun Design Challenge with Nina Designs! A group of blog partners were selected to work with identical packages of components to create unique earring designs. The rules were pretty simple. You just had to use at least three components from the ones they sent in the final design and submit a picture. On March 1st, all of the designs will be added to Facebook and the voting begins! The winner scores a $100 store credit! On Friday, when the contest launches, I'll post a link to vote and a picture of my earrings (which rock the house, by the way). I'm really happy with them and dug deeply into the hidden stash for some prized labradorite pieces and pyrite that will surely sway the vote in my favor. I mean, Gemstones + Nina Designs = Winning Combination. Right? In my last post, I mentioned some of the changes for the first SWARM event. The most major of the changes is that it'll be considerably downsized. Even though it'll be a more intimate affair, I think it'll be a most excellent time. Lynne Suprock, our featured instructor for the April festivities, has some really amazing workshops planned! Space is limited, so I encourage you to sign up as soon as possible! If you're interested in saving money and spending time with this incredibly talented artist, you might consider signing up for a Weekend Class Pass. You'll get a space in all four classes at a major saving. I think the theme for February must be "hard decisions", because I've been making a lot of them lately. I had a planning meeting with William about the upcoming SWARM event. We went over the things that were absolutely essential to make the event a go. The list started off manageable, but by the end of our conversation it was impossibly long with our current timetable. The meeting was a realty check. I didn't want to give up the vision I had of the Spring Event, but in my heart of hearts, I knew that I wouldn't be able to do it justice. There's just too much to do in too little time. One of our teachers was also overbooked and unable to teach the full weekend. So we had to make another hard decision. We'll be postponing the big event. We've got our eye on late summer or mid-autumn, but it's contingent on the host hotel and their availability. Instead of having all five teachers in April, we'll be featuring one teacher. 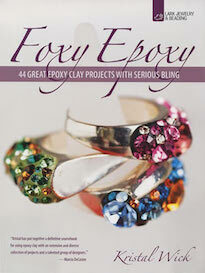 Lynne Suprock of Simply Pretty Stuff will be teaching workshops April 6th and 7th. 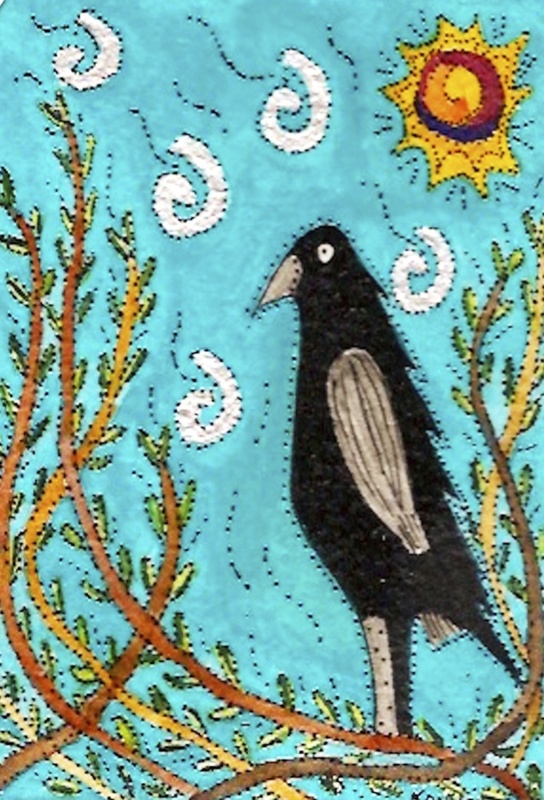 We will also be hosting workshops from Eva Sherman in May. I'll be sharing their workshops and how to sign-up tomorrow. Although it isn't the way we originally planned it, I think it'll actually be better. We'll be able to facilitate more learning opportunities and have more time to promote and develop the SWARM community and the corresponding events. (If you haven't "liked" the SWARM Facebook page, CLICK HERE.) Having more time will not only help us, but it'll also allow those who are interested in attending to plan ahead and save up, if needed. For the Artists Market it'll also allow the participating teachers, students and vendors to work on inventory and build up stock for the show. It was a hard decision to make, but I think it was a good one. 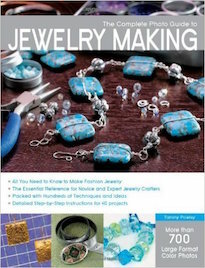 Lisa Niven Kelly has a new class over at Craftsy.com and a way to get 50% off when you register for it. Read a review and then go sign up! 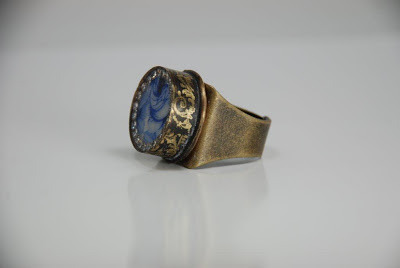 Carmi joins the CraftEDU faculty with her first class, "Working with Resin in Bezels". 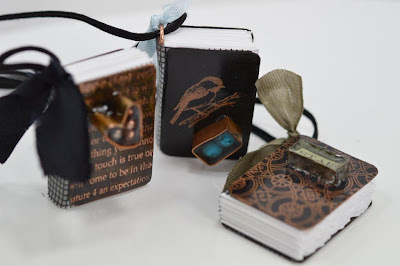 Resin Crafts has a great post showcasing a super easy transfer technique! 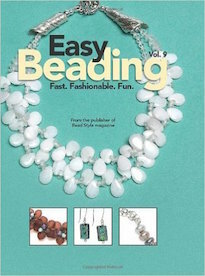 Jean is so excited by Issue 2 of the Digital Beading Magazine! You have to see it to believe how beautiful it is! Working with porcelain, Andrew creates some new pendants that are brightly colored and lots of fun! You never know how an event held in winter (particularly one that's subculture oriented) will turn out. 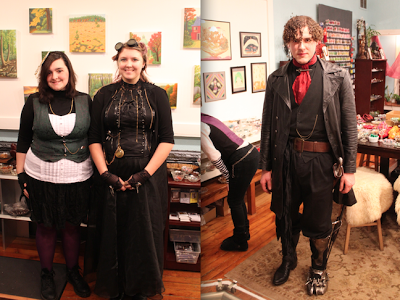 We really didn't know how the Steampunk Party would do, but were pleasantly surprised by the turn out! It got awfully crowded in the shop tonight! Here are our winners from the costume contests! The girls scored the juniors category and Clint took home the adult prize. I was really impressed with everyone who came in costume! For the Steampunk Party tonight, I made a batch of Earl Grey Brownies. Of course, I was too impatient to let them cool before I cut into them. The knife got all gummy and even though I was careful, the pan of brownies looked like I tried to use a dull hatchet to divide them up instead of a sharp knife. So what was I supposed to do? Throw them out and waste all that delicious chocolate and start all over? Nope! I chopped and mixed everything in the baking pan together, and formed little balls from the massacred brownies. While I had solved one problem, looking down at the platter presented a new one... my brownie balls looked like balls of poop! I quickly thought of ways that I could salvage the already salvaged brownies. There are lots of things that are chocolate brown and round and they don't look like potty. Truffles, for instance, could... in theory... look pretty awful, but they have a nice powdery coating that keeps them getting stuck together. Aha! I needed to roll them in cocoa powder. Unfortunately for me, the cocoa powder I had was unsweetened and it was ungodly bitter. I knew that I had to cut it down with some nice powdered sugar. But... as I reached for the bag of powdered sugar, my hand grasped at an empty space in the cupboard. Oh no! I forgot to replace the bag when I ran out. All was not lost! I had my espresso grinder, granulated sugar and a bit of corn starch. So I powdered my own sugar and then while I was at it, I finely ground some Earl Grey tea as well. I sifted the Earl Grey powder, powdered sugar, and cocoa powder together and saved the day! Now, why didn't I think of that before? I guess necessity is the mother of invention after all. If you don't give up, sometimes things turn out better than expected. On certain days and at just the right times, you'll see the snow and ice melt. 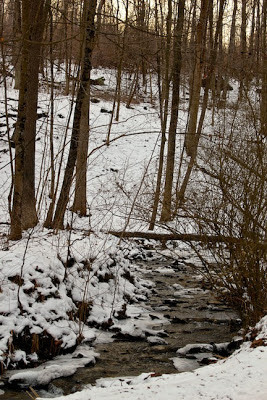 It's not quite the Spring Thaw, but occasionally it gets warm enough on these cold days for the creeks to unlock their icy grips and trickle along. If you follow these small streams, eventually you'll hit a bigger one. All these little tributaries flow into larger bodies of water. The banks swell with crystal clear water. It's so clear that in some spots, it looks like the artificial aqua of a swimming pool. The water here moves freely and fast. My life is a lot like this now. At times, things are frozen shut and are at a standstill. But then there are times when the sun comes out and things start to trickle along and eventually pick up the pace. I've made a lot of little progresses that add up! One of the biggest steps forward is work on the "Spring Event". Up until recently, things have been a little cryptic while we sort matters out. We're still fleshing the details out, but we're pleased to announce some major news. The "Spring Event" is the first official S.W.A.R.M. event. You might ask yourself, what's SWARM? It stands for the Society of Working Artists' Retreats and Meet-ups. It's a social community that is dedicated to creative education and artistic learning. The group corresponds to the in-person artistic gatherings facilitated by Allegory Gallery. You might be thinking, "Why the heck did you decide to call it that?" We chose the name "SWARM" to represent this community because the word means a collective behavior of synchronized movement. If you've ever been to a big art retreat or a show, then you know just what we mean! There's almost a hive-like atmosphere with people buzzing around. We're still working on it, but you can join the Facebook group by CLICKING HERE. The Spring SWARM Event will take place between April 4th and April 7th. We will be featuring FIVE teachers! 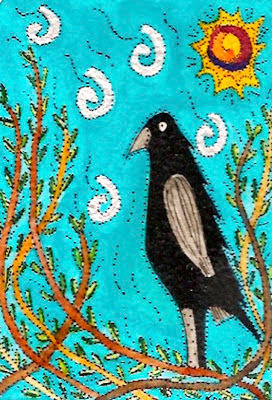 The line-up includes Eva Sherman, Kelly Russell, Maria Richmond, Lynne Suprock and Kathy Zimmerman! They will be teaching classes in metalwork, wire, mixed media, polymer clay, and fibers! The instructors teach across the country and are all widely published. We're really lucky to have them! We're not just having classes either! On the first evening, there's an opening ceremony with guest motivational speakers. Then on the next night, there will be an art opening featuring the work of Detroit-based artist and ceramist, Diane Hawkey. On the next night there is an Artist Market, featuring the work of the teachers, students and some select vendors. It should be an AMAZING time! More information is to follow and the best way to keep up-to-date with everything is to join the Facebook group by CLICKING HERE, but if you have questions, feel free to email us at info@allegorygallery.com and we'll be happy to answer your questions as the information becomes available. Other points of progress include pricing everything that we brought back from Tucson! We got SO MUCH stuff! We have an assortment of beads (semi-precious stones, Czech glass, wood, ceramic, bone, polymer clay, metal, vintage... etc. ), finished jewelry, sari silk fibers, AND new pieces from Candice Wakumoto!!! It took us days to separate, sort, log all the receipts, and figure out prices. We still have to tag a lot of stuff, but that should go quick. I also started taking notes on a book project that I'm going to submit. So far I haven't seen anything quite like it and want to strike while the iron is hot. This will be my first solo book project and I'm excited to see if I can actually make it happen. In other news, I started cooking for the Steampunk Party, wrote press releases, did some interviews with local newspapers, started planning the next storefront window, and caught up on some email. And... of course, I tried to keep up with running the store. So lots of progress. Sometimes it doesn't seem like much, but then when I write it all out... I kind of blow myself away with how much really gets done! Every year I tell myself that I'm going to make something to put on the table during the Tucson shows. Usually I get too busy or there's a kiln malfunction or something happens to prevent me from actually accomplishing this goal. I pressed out a small mountain of porcelain coin pendants in some of the molds that I've been using for metal clay components. I carved some of the designs, but several of my favorites were carved by my sister, Cynthia. She made them for me a few years ago when I was diagnosed with cancer to help combat my exorbitant medical bills. I'm really thankful for her help and think fondly of her whenever I use them. At the end of the show, I had intended on giving whatever was left over to some of my friends and fellow vendors, but I forgot that I was carrying them around. When we were unpacking at home, I discovered the bag and decided to post them in the online shop. CLICK HERE to check them out and learn more about how they're made. I really love them and the bright colors. I also really love the velvety texture of the glaze. I only have a few listed right now, but I'll be making more within the next few weeks! 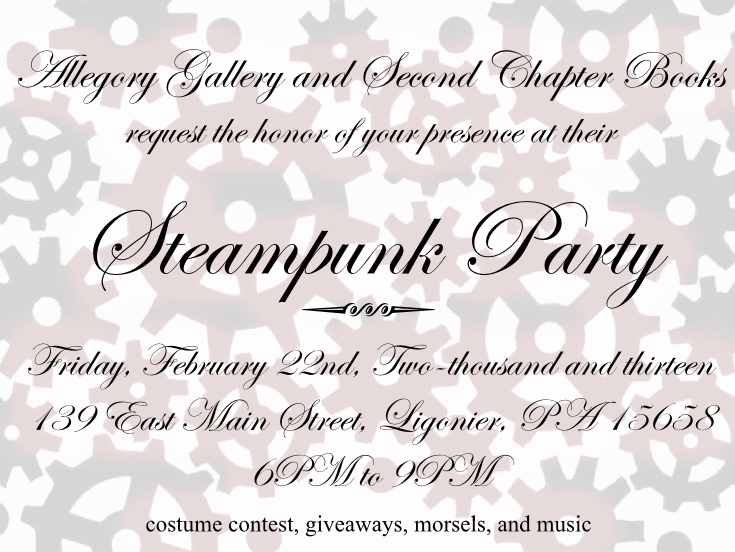 Allegory Gallery and Second Chapter Books would like to invite you to attend the Steampunk Party! 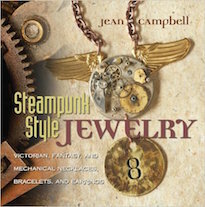 What's Steampunk? Imagine a style that mixes elements of the post-apocalyptic badlands of Mad Max and the lacy Victorian world of Jane Austen, creating a futuristic blend of rivets and ribbons! 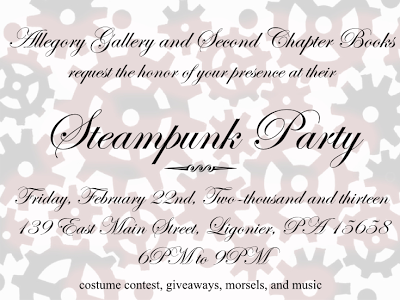 Get dressed up in your wildest Steampunk-inspired outfit and strut your stuff for a chance to win a costume contest! There will also be giveaways, morsels, music and a multitude of libations! Allegory Gallery will also be debuting their recent finds from their latest buying trip in Tucson! The party is on Friday, February 22nd from 6PM to 9PM! Costumes are encouraged, but not mandatory. When I was young, I made a mistake... a mistake that will haunt me for the rest of my life. Before I continue, I want to fill in some of the backstory. I did not have an idyllic childhood. After my brother left, my family began to fall apart. We fought. We argued. We blamed each other. Our family was fractured. As the youngest of a heartbroken family, I was mostly left to my own devices. I cultivated a fierce sense of independence and roamed the streets of Orlando on my bicycle in search of something that would fill the void. Luckily I found many friends who would become the family-unit that I so desperately wanted. Even still, I think I grew up far before my time. Fast forward a few years. On the surface, it might seem like I lived a charmed life. I was on the honor roll, an AP student, participated in after-school activities, won awards for volunteering, writing and artwork, I was the youngest board member of a church, and worked part-time for not one newspaper, but two. But at home, my parents and I fought constantly or ignored each other completely. I think part of my good deeds were to overcompensate for what wasn't there. I became jaded with the state of journalism and wanted to pursue my passion as an artist. I really didn't know what that would entail. But I saw an exhibition at our local art museum of Suzanne McClelland's work and read that she had went to college at the School of Visual Arts. I had also seen a movie called, Art City: Making It In Manhattan, and after some research, discovered that some of the artists featured in it were faculty members. A loose plan formed. It was more of a dream than a plan. The idea of leaving everything behind for a city that I had only seen in movies was crazy! And then September 11th happened and I knew that I had to make my way there, no matter what. I wanted to be a part of the healing process and I wanted to be an artist in The Art City. I applied for every scholarship and grant possible and met with a recruiter for what would become my future alma mater. My parents, particularly my father, did not approve of my decision. But at that point we were at each other's throats so much that I wasn't the only one relieved when there was a majority of the Eastern Seaboard between us. That first year was one of the most definitive of my life. For the first time, I was able to embrace my independence. I worked hard. I played hard. And somewhere in between, my parents and I started talking again. Becoming an adult, I realized that they were just human and they were people too. Just because they wore the titles, "Mom" and "Dad" didn't mean that they were superheroes with the ability to right all the wrongs in the world. Even still, there was a long way to go before things would be completely repaired. And... that's when I made the worst mistake of my life. I got a letter taped to my door that said my funding had run out and that if I didn't act, my things would be removed and thrown on the curb. I met with my financial advisor that informed me that due to budget cuts and funding issues, many of my scholarships were either discontinued or had run out. The only way to continue was to borrow more money. She said that if I wanted to be a successful artist, I needed a degree and without the additional loans, I wouldn't be able to get my degree. I would be a failure. I would be a loser. I had sold some of my paintings and was already building my name. I didn't want to stop learning. I didn't want to stop my career before it even really started. I thought that if I could keep selling my work, that I could pay it off without a problem. All I needed to do was get a co-signer for my loan. I was panicking and scared. Even though I had grown up in a lot of ways, I wasn't prepared for this. So, I encouraged my parents to co-sign on the loans. I think that they thought that if they didn't sign the loans, they'd lose me like my brother. After reading all this, you might be questioning... so what's the big deal? You signed a few papers. You got your parents to autograph some forms. So what? What I naively did was enter into indentured servitude, not only for myself, but for my parents as well. The amount that I owe in my student loans is staggering. I've ruined my credit. I've ruined their credit. I've ruined their retirement. Even if I live to 100, I will never be able to repay the debt in its entirety. Even if I go bankrupt, the student loan debt will remain. I could live high on the hog and max out a sack of credit cards and then file for bankruptcy and with the help of high-interest, low-limit credit cards, be able to restore glowing credit within 7 years. The same cannot be said about student loans. I carry this weight around every day. Knowing that my dad still has to work, even though his hands are crippled by arthritis, adds to the everyday anxiety. I try not to let it get to me too much. I try to focus and visualize on how I can do my best and hopefully, by some miracle, overcome this obstacle. This overwhelming pressure certainly has an affect. As we build our business, this challenge has shaped how we operate and has prevented us from doing many of the things that we would have liked to do. In some ways, it has been a good thing. It has forced us to be creative and utilize the resources at our disposal in interesting ways. Necessity is the mother of invention, after all. One of the recent changes that this has had an influence in is that we won't be able to help my family out at trade shows anymore. I have been working shows for almost ten years for Green Girl Studios. Some people don't even know my name... just that I work for "Green Girl". But realistically it's too expensive for me to leave the store for long stretches of time at this stage in the game. I have to be proactive and hands on. I also want to devote all my attention to making sure that Allegory Gallery has strong foundations to grow from. I have to embrace my own path completely. It was a hard decision and one that wasn't considered lightly, but one that had to be made. I love and support my sister and her husband and their company and will continue to promote them and their work endlessly. There are no hard feelings or ill will. As I contemplate early mistakes and make major changes, I also must also acknowledge that despite hardship, there is room for limitless possibilities and potential. The house that we rented in Tucson was at the base of a mountain range. Every morning before we left for the show, we'd marvel at the view. One of the things that struck me was how the weather on the mountains could be so different from where we were. At the house, it could be sunny, warm and dry... but at the top of mountain, you could see snow and fast-moving rain clouds. It would send a shiver down my spine thinking of the icy environment up above. I could almost feel the gusting wind raking against my face. Last night I got an email from a long-time blog reader. She mentioned how my early days of blogging had set a standard for her and how much of what she does now on her own blog is patterned after those earlier entries. She's not the only one to notice how different the style of the blog is now. A lot has changed since I first started the blog. When I first started this blog, I was still trying to figure a lot of things out. I wanted to present myself as a real life person with real life challenges. I was tired of seeing people cloak themselves in the mysterious artist persona. I was also secretly trying to find my brother. I thought that if I could put my story out there, maybe someone who knew something or someone who saw something would say something. To achieve my goals, I had to put a lot of myself out there. The risk of doing this is that when you open yourself up, you become vulnerable. Over the years, I've met a lot of people through this online portal. Most of them have been highly supportive and encouraging. Many of them were also on their own quests and we traveled the road together, trying to solve our own personal mysteries with one another. A few of them were openly aggressive and nasty, and some were more cunning and devious. While the number of those who were positive far outweighs those that were negative, the effect of those who were malicious was felt more deeply. I have been subconsciously recoiling and separating myself from the online stream. I'm reminded of the armadillo... once poked, it curls upon itself... creating a tough armored exterior, only poking its head out from time to time to see if the threat has passed. I was on that mountaintop, cold and windy... hidden in the cloudy haze. The blog was in the valley, kept warm and separate. There's a comfort in isolation. Other factors have come into play as well. We opened Allegory Gallery and my brother returned. The opening of Allegory Gallery redirected a lot of my attentions and energy. It also made me make my posts less personal and more about what we were doing in the store. The return of my brother had a profound impact on all of our lives. For so long, I built who I was on this emptiness and vacancy. I defined myself as a survivor of loss. But then, a miracle happened. Our prayers were answered and my brother was restored to us. What do you do then, when the foundations have shifted so completely? You can't just be "business as usual" and keep doing what you've done in the past. Things are different and there's no use in pretending that things are as they always were. Things have changed. When you achieve your goals, do you hang up your hat? Do you retire to the mountaintop permanently? Do you just stop? This blog has never been about the destination. It has always been about the journey and exploring how things happen. As I consider the future of the blog, I have to take in account the new developments and evaluate what's important. It's a constant process of refocusing, refining and readjusting. One of the things that's paramount is maintaining the human aspect of Allegory Gallery. It's an artist-run space for creative individuals. I want to dive into the stories that make our space so rich. Just because we're a brick-and-mortar store and most of my energy is being poured into building the success of this project, I don't ever want it to become sterilized and thought of as "corporate". I want the space to be thought of as a living and breathing entity with a human face and a human heart. I also want to continue building relationships with others who are hanging their digital shingle and forming a community of creative minds. As I look forward, I must look also back... and find a middle path between great heights and low valleys. In the most recent issue of the Ligonier Echo, there's a write-up of Jen Tong's show, "Creatures of Ghost Island". (Click the above photo for a larger view.) The show will be up until February 28th. If you can't make it in person, check it out online! CLICK HERE to see the show on the internet. You can also purchase works from the show via the website as well! Looking for a way to remember your furry friend? How about making a doggie for your wrist? A little bit of red can go a long way in any jewelry design. 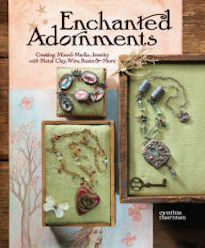 Cyndi has finished up her second e-book, "Some Assembly Required"! Yay! Finishing a big project is always a relief. 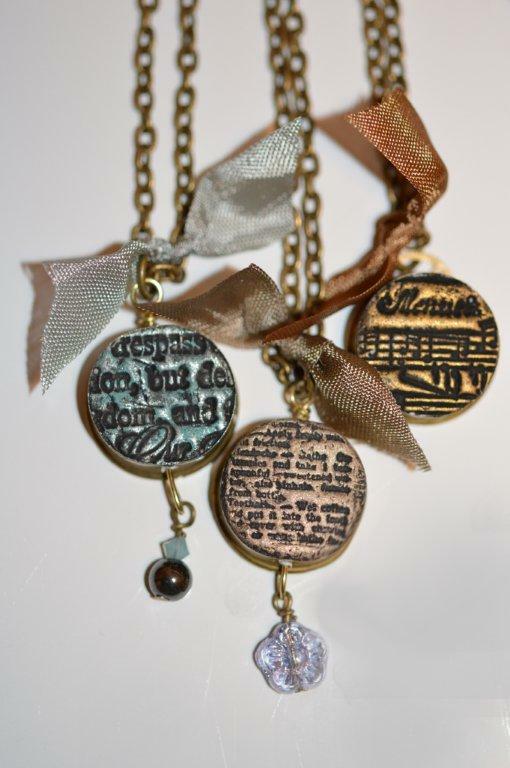 A love for Downton Abbey has resulted in this statement necklace! An experiment with quilled paper has resulted in several stunning resin filled bezels. 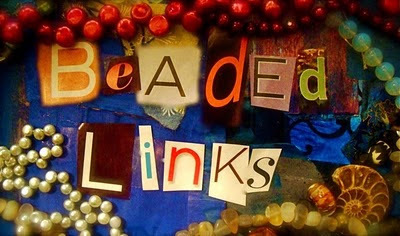 Jean writes all about her cool bead partner for the 7th BSBP hostessed by Lori Anderson! Featuring the Pantone color of the year, Andrew creates a peyote stitch bracelet with a NEW button from Green Girl Studios. We have been back now for a few days. The perfume of the mesquite after rain is fading in memory. The upright silhouettes of saguaro cactuses are replaced with the barren branches of oak and maple trees powdered with snow. My time in the desert seems like a dream of an alien world, so different from my everyday. This trip was harder than previous ones. Much of that was due in part to the ending of a friendship and a business relationship. While the actual split occurred a few years ago, it was freshly brought up on a daily basis. I felt like the widower or the recently divorced, reminded of the loss at every innocent question asked by those who didn't know of the division. I could feel the discomfort of mutual friends who only desired to stay neutral. At those prompts, the old feelings of betrayal blossomed anew... coloring my cheeks scarlet and my heart black. The mere mention of her name made me feel wrapped in the barbs of ocotillo. Part of those needling emotions stemmed from the feeling of isolation and embarrassment. People had warned me of the unhealthy association and I thought that my story would be different. But their predictions came to pass and I joined a secret club of the jilted, used, and tossed aside. I say that it is a "secret" club because so many people want to be professional and take the high-road, and as a result, they hide what happened to them. I didn't want to be one of those people that suffers in silence, so I made a public announcement on my Facebook page that I was no longer involved – professionally or personally – with this individual. A friend cautioned me that I would be opening myself up to more attacks and more venom. So, I took the post down. But some saw it... and... an odd thing happened. The secret club acknowledged me as a member, sharing their stories in passing. I didn't want to be involved with this person or even stories of them, but there was a strange comfort in knowing that I wasn't the only one. There were dozens of people who all had been misused and maltreated. Hearing these stories allowed me to let go of my own. I had held it in my heart, coiled like a snake ready to strike. I set the cage of ocotillo on fire. I walked through the flames and felt renewed. I had thought that I had worked through the hurt before, but all it did was disperse the fog until it had a chance to collect again, slithering together and growing new mass and volume. The thing that I learned is that some people have passed the point of redemption. They will never change and will continue to repeat the pattern, again and again. They pray on those that want to see the best in others. They will charm you with their spin. But ultimately and fundamentally, the corruption that is in their heart is rooted too deeply. They cannot change, because they don't see a need to change. The fault is always in someone else. They cannot better themselves because they see no need in it. Even though the list of those wounded by their words and actions grows daily, the wounded are collateral damage and the idea of protecting their feelings is an unnecessary obligation that is simply not their responsibility. If there is someone in your life who makes you feel small or worthless, do not let them. If there is someone who hurts you, do not let them. If there is someone who is using you and manipulating you, do not let them. You deserve better. If you can identify the problem and see the need for change, you are better than they are, because you can break the pattern. You can stop the cycle. You can say, "NO!" You can shout it out and stomp your feet and reject the poison and propaganda. Do not let another dictate your self-worth. Listen to your gut and let go of those who would do you harm. This year's trip to the desert was a harder one for me, but one that came with a rich reward... freedom. 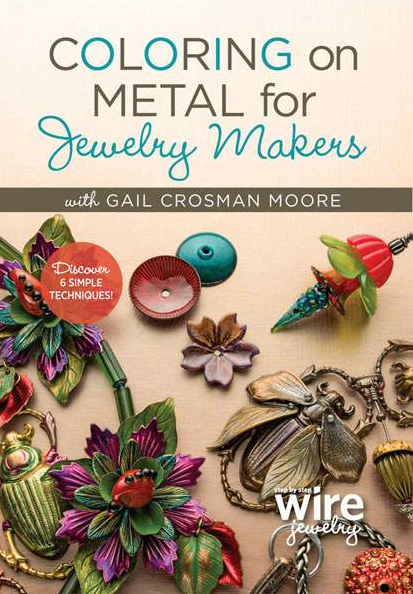 One of the annual traditions we partake of while we are in Tucson is the Interweave Party. We've been going for almost ten years. The venue may have changed over the years, but the same positive atmosphere that this publishing company has pulled together has persisted. (It used to be at the Botanical Gardens, then at the Art Museum, and now at the iconic Hotel Congress.) With the recent acquisition from F+W, we didn't know if they would have the party again. We were pleasantly surprised when we received our RSVP. Nothing quite says a good party like grainy cellphone pictures. Here are Mel and Lisa Niven Kelly of Beaducation and Heather of the Trinket Foundry. This picture is of Julie Young of TierraCast and Kieu Pham Gray of the Urban Beader. This picture is of Lisa Kan and editor extraordinaire, Danielle Fox. 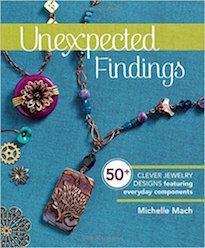 Danielle is also the author of Simply Modern Jewelry and Mixed Metals. We had a wonderful time talking with everyone and seeing familiar faces. I hope to go to keep going for another ten years! The idea of going to a party after working all day can sometimes be not so appealing... especially on a very chilly evening. But this particular party was for Beads of Courage and their 10 year anniversary and the cause was really great! They do so much and make such an impact on the lives of children going through very hard times. As a cancer survivor, their mission is very near and dear to my heart. So we got our coffee, donned our heavier coats and made our way out to the Metal Arts Village for the celebration. When we arrived, we were greeted by the soulful music of The Tryst. They were playing in a pavilion in the parking lot and provided a pleasant auditory backdrop for the evening's fun. 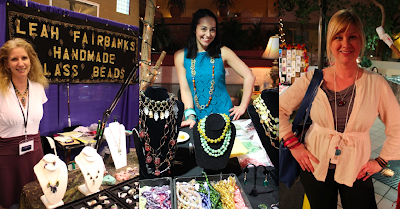 It was a really fun event and there were so many friends from the beading community in town for the Gem Show that were in attendance to show their support. Featured in this picture are: Katie Hacker, Kristal Wick, and Kate Richbourg. The night was studded with all kinds of talent, including one of the residents of the Metal Arts Village who just happened to be Greg's estranged sculpture teacher from college! What are the chances? We had a wonderful time and feel fortunate to be able to participate in such a worthwhile activity. Make sure to swing by the Beads of Courage Facebook page and "like" them. You can visit their page by CLICKING HERE. It seems that with every event and every show, there's another creative friend to be made. Over the years, I have been fortunate enough to add many to my circle of friends in the community. It is always nice to see these familiar friendly faces and catch up with them. 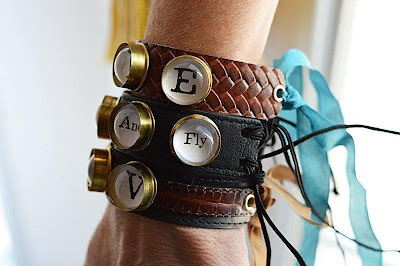 Anne Engelhardt of Craft Fantastic. Heidi and Jodi of LillyPilly Designs in front of their NEW cork board, slate, and micro-suede! Renee from Ashes 2 Beauty. Joyce Rooks, Pamela Hawkins from Bead Design Studio, and Anna Draeger. While I was at the Best Bead Show, I kept my hands busy while talking with customers and created this peyote stitch button bracelet. I used the new Pantone color of the year: Emerald! I also used a NEW pewter fox button from my family at Green Girl Studios as the clasp mechanism. Our time in Tucson has been speeding by. I thought that I would give an update including some pictures from some friends from the shows! 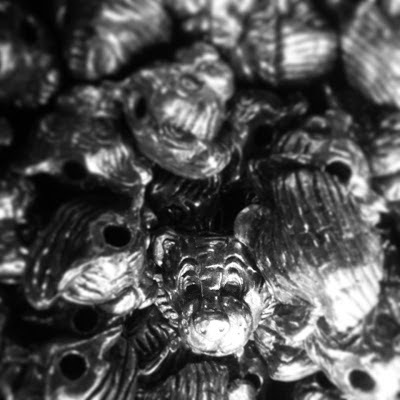 Prisicilla Marban of Priscilla Beads. 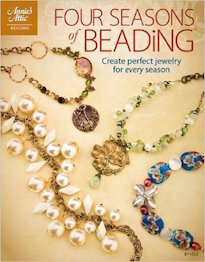 Susan Hanson of Heartsong Beads, Andrea Guarino-Slemmons, Dave and Jolene Star of Bazaar Star Beadery. The lovely "Fusion Girls": Katie Wall, Lindsay Burke and Mari of Fusion Beads. Nir of Nirvana Beads, Stephanie Ann, and Diane Fitzgerald. Gretchen Schueller of Piece of Mind. Denise Peck and Karen Keegan. Tonya Davidson of Artful Success, Jeannette Cook of Beady Eyed Women, and Leslie Rogalski of Sleepless Beader.